The vessel incorporates several innovative solutions to reduce its environmental footprint by minimizing its energy consumption and emissions. The shipping company and MacGregor, which is part of Cargotec, have developed the world's first autonomous cargo processing solution for the vessel to further improve safety and efficiency. 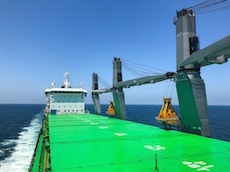 The vessel will have raw material cargo while arriving from Japan to the Baltic Sea, where the vessel is currently scheduled to arrive in mid-September. "Our new vessels have met with an excellent reception among our customers. Every employee of our shipping company should be genuinely proud of what we have achieved during our new construction project", says Mikki Koskinen, Managing Director of ESL Shipping. This new construction project is part of the Bothnia Bulk project, partly funded by the EU. Its goal is to modernize the sea route between Luleå, Oxelösund and Raahe to be more eco-friendly. In addition, environmental emissions will decrease at port with the improved availability of shore-side electricity. The vessels have been designed by Deltamarin in Finland, and European equipment suppliers have provided roughly 60 percent of all vessel systems.